Half the aubergine, cut round the flesh with a knife and scrape out flesh with spoon, place aubergine shell in pre-heated oven and cook until tender. While the shell cooks, Dice the onion and the aubergine flesh. Heat the olive oil in a large frying pan and add the onion and chorizo, cook on a medium heat until the onion is soft and the chorizo has released its juices. Add the kale and cook until wilting then add the aubergine flesh and smoked paprika and cook through. Remove the shells from the oven and stuff with the filling from the pan, top with one or two slices of goats cheese and breadcrumbs, return to the oven and cook until the breadcrumbs are golden and the cheese has melted. 23 members have added this recipe to their cookbook. 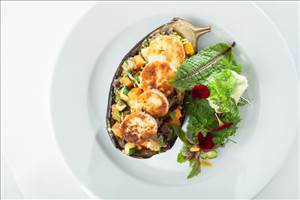 There are 521 calories in 1 serving of Stuffed Aubergine II. Calorie Breakdown: 63% fat, 20% carbs, 17% prot.